Custom wallpaper allows you to decorate in ways you typically wouldn't consider. Especially if you're a stoic modernist who likes to surround yourself in neutral white and off-white color schemes. Whether you like the minimal design aesthetic, or you just haven't painted the walls in your new home yet, use a custom wallpaper installation to introduce a brand new color palette to your decor scheme. The inspiration room above was strictly white: white walls, ceiling, window treatment and chandelier. To us, this offers up the opportunity to experiment with color on an accent wall. The entire room doesn't need to drowned in color to effectively capitalize on some non-white hues. The custom wall mural situated behind the desk is makes a huge difference to the room's look, while still being nicely reigned in, letting the predominantly white decor speak for itself still. Using a colorful custom wall mural to cut through the all-encompassing sterility of a purely neutral color palette is the perfect way to bring more visual interest to a room, while still adhering to a more modern design sensibility. The inspiration room's wall mural is not only colorful, but has a great sense of motion and shape as well. Tired of white walls staring blankly back at you? Bring some more color to your life today! 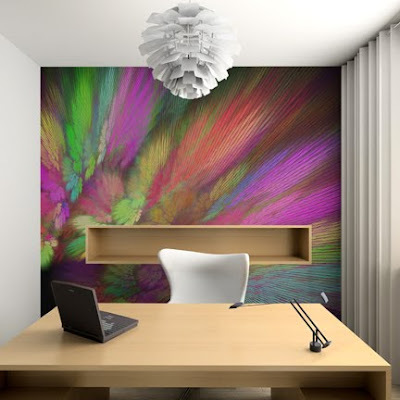 In this case, the custom wallpaper provides a feature to a minimalistic design room, and makes the wall stand out without a special room decor. It is something i had never considered until recently. However since viewing your blog it has placed a whole new perspective for me. Yes i am completely agree with Nicolette because custom wallpaper is a good source to get amazing wallpapers without a special room decor. However the main things comes to our mind when we actually do it and may be that will good one also but appreciate Nicollete idea. I am looking to purchase some good Italian dining room furniture from Spacify as they have various European and Italian design furniture to give the right feel to home decor. I have purchased some Contemporary furniture from Spacify and feeling great with it's product quality that are perfect blend of style and utility and all this i am getting in affordable cost.